in Brazil, sits for an interview. Ricardo Gilly is a guitarist and arranger. In Brazil, the profession of songbook reviser was practically born with him. Since 1989, more than 70 scorebooks have passed through his hands. Gillys work involves transcribing recordings, revising scores, adaptations for piano or guitar, arrangements, and graphic layouts. At Almir Chediaks Lumiar Editora, , Gilly worked on the songbooks of Noel Rosa, Tom Jobim, Gilberto Gil, Vinicius de Moraes, Carlos Lyra, Dorival Caymmi, Edu Lobo, Ary Barroso, Djavan, João Donato, Chico Buarque, Braguinha, João Bosco, and Ivan Lins, among others. At Tom Jobims invitation, Gilly took charge of musical revisions on the composers comprehensive Cancioneiro, for which he also wrote various adaptations for piano. Also at Jobim Music, Gilly worked on the Cancioneiros of Vinicius de Moraes, Moacir Santos, and Humberto Teixeira. ForAcari Records, Gilly laid out the Cadernos de Choro and Princípios do Choro collections. He also was involved in the O Grande Circo Místico songbook (Lobo Music) and a Zé Paulo Becker songbook. I asked Gilly a few questions about his work. When and how did you become interested in the guitar? I began to play at the age of 13 or 14, all by myself. Im the youngest in a family that used to listen to a lot of bossa nova, Cyro Monteiro, Chico Buarque. From a very young age I was aware of composers such as Gilberto Gil, Milton Nascimento, and Tom Jobim. Its funny how, listening now to Wave (1970), I see how influenced I was by Toms guitar beat, which is very beautiful. Few people know that he is the one whos playing guitar on that album. At the time, it was very difficult to obtain the sheet music. You had to buy imported songbooks at the Musical São José, a store in Copacabana. What was your musical education? I studied harmony and arrangement with Ian Guest, a great master and friend. I owe him a lot. He is a Hungarian [original name: Janos Geszti] who has played a very important role in musical education here. He pioneered the Kodály method in Brazil and defined a tablature system that is today the standard in Brazilian publications. He formed an entire generation of good arrangers. I was very happy when he invited me to revise his books on arrangement and harmony. When did you begin working with Chediak? It appears that you entered Lumiar after the first songbooks of Caetano and Bossa Nova. Yes, I entered shortly after they started. I was introduced to Almir Chediak by Ian, who had been his teacher as well. My first job was to transcribe songs by Gilberto Gil and Djavan for books that would end up being released only years later. I learned musical revision while working on volumes 4 and 5 of the Bossa Nova Songbooks and on the Rita Lee Songbook. Then I landed a dream project: Tom Jobim, in three volumes. At that time (1990), he lived in New York, and we revised the scores by phone or fax (which was the latest thing then). Shortly thereafter, he returned to Brazil and even played at the launch of his songbook. When I began revising the second edition (many errors appeared in the first), I mustered my courage and phoned Tom to clarify some questions. He said, Can you come here tomorrow, so we can look at it? I went trembling from head to foot, but he soon made me feel at ease with his simple jeito and famous generosity. I was impressed with the serious determination in which he carried on the work. We met a number of times, and the confidence he had in me (imagine your idol flattering you!) was a decisive incentive for me to follow this profession. Tom also referred me to his son, Paulo, so that I could collaborate on the Cancioneiro for piano. It was Paulinho Jobim who taught me to use the music notation software Finale. Describe the process of turning a collection of songs into a songbook. The first stage involves selecting the songs and the recordings. When the composition is relatively recent, its easier to determine which recording to use for the transcription, but there are cases when this step requires a lot of research. In the Ary Barroso Songbook, for instance, some of the songs had four, eight, or even ten different versions. One has to exercise great care in determining which sources to use. Once selected, the song is notated and the score goes to revision. Here we define the criteria for the published music: whether to simplify the interpretation or not; whether to follow a specific recording or to adapt tonalities and harmonies. We need to figure out whether that introduction is really part of the tune or is just an arrangement, and so on. Naturally, these choices have to respect the style and the period of each composition. Then we take care to pass each song by the composer. We play the music on piano and on guitar, with one generally playing the harmony and the other, the melody. In this process, I worked with many top-notch musicians, including Ian, Fred Martins, Itamar Assiére, and Cristovão Bastos. In the Lumiar songbooks, I have to add guitar tabs to the lyrics, draw diagrams of the guitar chords, add the notated score, copyrights and other items, and arrange everything on the page in a final layout, taking care to minimize page turns, so as not to interfere with the playing. When I began, the artwork was still being done by hand with transferable rub-on lettering, stylus, and gluetotal madness! as Almir would say. When it finally looks as if everything is ready, you actually have to go through three or four additional revisions until its impeccable. The work is very labor-intensive, and you have to be detail-oriented, because the error is surely there, but youre not noticing it. Carlos Lyra says that I do a policemans work. Do you prefer to work with or without the composer while editing a songbook? When does the composer help the work, and when does s/he hinder it? In my case, its never happened that the composer was a hindrance. They always helped, because they are the ones who know the details, the organic part of the song, without the interference of arrangements or modifications that interpreters often insert. The work is easier with composers who know how to notate music, like Tom Jobim, Edu Lobo, Carlos Lyra, Francis Hime, Sueli Costa, Marcos Valle, João Donato, Ivan Lins, etc. There are also those like Chico Buarque, João Bosco, and Djavan, who dont notate but know exactly what they want and correct errors on the spot when you play the music for them. Of course, they happen to be geniuses. You worked with several music publishers. Is there a difference in their methods while putting together a songbook? Yes. At Lumiar, as I said, I begin with the recordings. In other words, everything needs to be done. At Jobim Music, I usually pick up the work at a more advanced stage. In Cancioneiro Jobim, many piano scores had already been written and revised for at least five years by Paulinho and Tom. Nevertheless, it took us an additional ten years to conclude everything. Two of the Moacir Santos Cancioneiros had piano adaptations based on the composers original orchestrations. 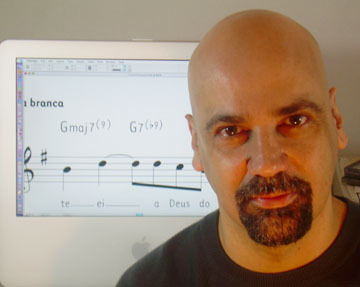 At Acari, the Cadernos de Choro scores written by Mauricio Carrilho are well defined and require little in the way of revisions. There Im chiefly responsible for the graphic layouts. Do you have any observations that youd like to pass on to the readers? Perhaps because this is a new discipline in Brazil (I believe Im the only one whos been making his living from it for so long), the importance of the music reviser is still unrecognized by most people. Tom Jobim said that written music is the music that survives. Nobody today would know Bach had he not written down his music. Thats why Im conscious of the challenge and the responsibility that I and my colleagues face. If I had to sum up my feeling for this work in one word, I would say: affection. Its what keeps me interested in dedicating so much time to each song. I know its inherently a thankless job: if anything goes wrong, its chalked up to the revisers incompetence; when all goes well, it looks as if no work was required at all. With every new publication I try to make the score more beautiful, cleaner, and easier to read. This year will see the publication of a gorgeous book from Jobim Music: Humberto Teixeira, with arrangements by Wagner Tiso and graphics by Gringo Cardia. It will be the 74th book on which I worked. A good mark for my 43 years. For a while now, some of my friends have been trying to convince me that its more important to work on my own music and record my own discs, but I feel good here. I can do what I enjoy most, which is arranging. This year, Im collaborating with the Escola Portátil de Música in a wonderful choro program thats accessible to many students and taught by the best bambas in Rio de Janeiro. In 2007, we want to include courses in Finale and techniques of musical revision. Theres still much music to be written, and we need to prepare the new generation for this task. Copyright © 20062007 Daniella Thompson. All rights reserved.